I didn’t think it was possible. I mean, Sarah Palin has pretty much been the definition of the phrase "inane absurdity" (I know that comes perilously close to being redundant) for well over half a decade*, but today she appeared on The Today Show and was briefly interviewed by Matt Lauer. She has a new book about the (fictitious) "War on Christmas" but he first asked her some questions about the health care law, Chris Christie, and general politics before getting to the book. I’m almost sure there wasn’t a single thing she said that was not either blatantly false or patently absurd. I cannot fathom why… no… wait. I can fathom why this woman still has a public platform, but it pains me to think there are enough people in this country to voluntarily and enthusiastically provide it for her. That so many either agree with or believe her is truly indicative of a sad state of affairs in this country. If only McCain had chosen someone else. * Palin would occasionally lend the definition to Michele Bachmann. The Tea Party (and the Tea-Party’esque Republicans) seem to want more abortions… or at least they want to create more unintentional pregnancies, increasing the demand for abortion services. This same group, however, wants to defund the programs (Planned Parenthood and Title X) that are best equipped to provide education, contraception, and reproductive health services for women who have the highest risk of unintentional pregnancies. Well over 60% of abortions are performed on women under the age of 30. Roughly half are performed on women with an annual household income less than $30,000. Planned Parenthood and Title X are huge providers of reproductive health services for this demographic, including cancer screenings, pregnancy tests, STD treatments, menopause treatments, tubal ligations, and low-cost contraceptives. The reason the Tea Party wants to defund these programs, presumably, is because these programs can potentially present information about (and, in the case of Planned Parenthood, perform) abortions. Title X cannot perform abortions or recommend abortions. Roughly 2% to 3% of Planned Parenthood visits involve abortions. That leaves a whopping 100% of Title X services and 97% of Planned Parenthood services dedicated to other reproductive health care services… services that have a direct impact on whether young, low-income women get unintentionally pregnant. Even setting aside the incendiary issue of whether abortion is a medical procedure or an abomination, defunding Planned Parenthood and Title X is a completely absurd position to take for a group that, to its core, opposes the very existence of the abortion procedure. The reason it’s absurd? Opposing the programs that provide low-cost contraceptives and sexual health services is effectively promoting increased unintentional pregnancies, thereby increasing the demand for abortion services. The best way to lower the rate of abortions isn’t to outlaw abortions. That would just make them dangerous. The best way is to reduce the number of unintended pregnancies. That can be accomplished, in part, by providing affordable contraceptives and sexual health education to the women who have the highest risk… which is exactly what Planned Parenthood and Title X do. Defunding these programs is simply a big “thumbs up” for abortions and a big “thumbs down” for women’s health. …and that would be an abomination. The Republican National Committee will be in Hawaii this week for its annual meeting to discuss its agenda. One of the items on the agenda is a series of ten statements dubbed the “purity” test by the media. The actual name is a mouthful: Resolution on Reagan’s Unity Principle for Support of Candidates. The idea is that Republican candidates must agree with at least eight of the ten statements in order to qualify for campaign contributions and/or an endorsement from the RNC. It seems it was originally proposed in November of 2009, but wasn’t taken up for consideration. Reportedly, it will be this week. I’ve read mixed reactions about the proposal. Some think it’s a good idea. Some think the Republicans are shooting themselves in the foot. Of course, the RNC can do what it wants, and though I can understand their desire to have a sort of litmus test for candidates, this seems somewhat draconian. Here’s a link to the entire document (it’s a PDF), and below I have a list of each of the ten items along with my commentary on each one. I’m onboard with that… except for the wording. It seems silly to include the final clause “by opposing bills like Obama’s ‘stimulus’ bill.” Not only are the scare quotes overly dramatic and laden with unnecessary sarcasm, but wouldn’t it be more constructive to give a more positive suggestion about how to reach the goal? Again with the unnecessary “Obama-style” word choice. Why not just “We support market-based health care reform?” I think a simple approach to health care reform would be a good choice, but of course there needs to be regulation. There is some good in the current healthcare proposal… no exclusions for pre-existing conditions, for example… but something leaner would be better. On the other hand, if the current proposal doesn’t pass, healthcare reform will be essentially dead for another few decades. I suppose I can say that I, too, support market-based health care reform, but it really depends on what is meant by “market-based health care reform.” There’s plenty more to say here, but I’ll just leave it at that, since the statement is so vague. This statement is mostly meaningless in what it supports, but says more about what it opposes. Republicans are notorious for being climate change deniers, and it almost seems that their denial stems from their dislike for any solution that costs money. I don’t know what is meant by “market-based energy reforms” but gauging from what I hear from many Republicans, it means letting companies pollute all they want, drilling for more oil, burning more fossil fuels, and flipping the bird to the environment… and to science. Hooray! This is one that I support 100%!… and it’s strangely specific compared to most of the other statements. The union push to eliminate anonymous voting is basically giving them free rein to use precision bullying and intimidation tactics. They complain about corporate intimidation of employees, but the fact is that, with secret ballots, neither the company nor the union knows how any individual voted. That’s as it should be. I’m of mixed opinion here. I support legal immigration and assimilation into American society. The rest of the statement is a non sequitur in reference to the first part. You don’t support legal immigration by opposing amnesty. The two are related but not dependant. I’m undecided on the amnesty issue. “We support victory.” That’s meaningless tripe. Everyone supports victory. It’s not a question of whether someone supports victory or not. It’s a question of whether victory is even possible… which it probably isn’t in any meaningful way. Invading Afghanistan was understandable and (mostly) warranted. Invading Iraq was not. That aside, these people have been fighting amongst themselves for longer than our country has been in existence and suddenly we think we can resolve all their problems? Not gonna happen. Waste of money. Waste of time. Waste of human life. Yes. I support this as well, but the caveat is that it depends on what they mean by “effective action.” The recent Republican track record on this is less than stellar. The Defense of Marriage Act is nothing but blatant rights-removing, religion-based bigotry and homophobia. No… I don’t support this statement in the least. I’m okay with this statement, too, assuming it doesn’t mean that Average Joe and Frank the Felon can stock up their houses with automatic weapons and RPGs. The statement is vague on that point. I think existing regulations are fine for the most part… waiting periods and registrations are nothing insidious. So, overall, the statements are a bit too vague to just accept unconditionally… and a few of them are vague to the point of meaninglessness… and at least one is reprehensible. It doesn’t seem to be a collection of statements on which the Republicans want to hang their future, but it will be interesting to see what they decide. However, it looks like I would pass the test because I support at least eight of the statements. In most cases, my support is conditional, but given the vagueness of some of the statements, I think it’s only fair that I add the necessary detail on my own. But even though I’m not a Democrat, I don’t think I’ll be calling myself a Republican any time soon. They still have a long way to go. Time to take away her matches. 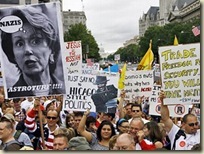 From John Moltz comes a link to an interesting perspective of the recent Washington, DC “Tea Party” protest march. He links to Matthew Yglesias’s website with the following quote. As was the case with the bulk of the protesters, there was very little sense that anyone had any actual specific complaint with Obama’s health care proposals. That one woman loves the confederacy. This guy thinks guns are great and diversity is stupid. Many protesters feel that abortion is murder and/or that Barack Obama is in league with terrorists. But nobody had a sign urging the president to adopt more stringent cost control measures, or slamming the concept of regulations to require insurers to cover people with pre-existing medical conditions. I don’t know if that’s valid criticism or not since protests (on pretty much any issue by any group) generally tend to be more about displaying slogans than offering solutions. The signs I’ve been seeing in the photos I’ve viewed seem to express opinions on a pretty wide array of issues… including taxes, the deficit, ACORN, lies, socialism, Hitler, health care, and God. Some signs seemed to be well thought out by intelligent people. Some signs were obviously not. Some were absurd. Again, I think that’s probably the case with almost any protest. You’ll find signs by sincere, intelligent, knowledgeable people alongside signs by folks who have good intentions, but are just running on pure emotion and don’t really know too much about the issues… alongside signs by people who are certifiable whack jobs. The signs will run the gamut from concern to anger to disgust to outrage to blind hate. Most of the reports I’ve read about the protest this past weekend are saying that the crowd was exceptionally well-behaved. I haven’t read anything about any “incidents” occurring that would mar the gathering. That (in my book anyway) is a real plus for this protest. Whether I agree with some or all of the protestors is another issue altogether, but I’m glad I live in a society where this kind of gathering is allowed to happen. There are some things about this country I think are wonderful and some things I think are pretty messed up, but freedom of speech and freedom of assembly are two of the great things. I’m sure President Obama would agree with me. 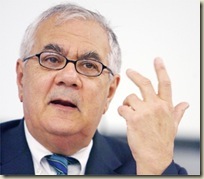 Barney Frank refuses to play the game that angry right-wingers try to play at some of the town hall meetings that have been going on about the health care issues. There should be more of this type of response when people are either blatantly ignorant, obnoxiously unruly, or simply rude and inconsiderate… which are things that seem to be disturbingly common at these meetings. People are shouting out outrageous accusations or asking questions based on incorrect information and then shouting down any attempts to correct their ignorance. Seriously? The best health care system? Are we talking about the least expensive health care system? No. Are we talking about the most effective health care system? It seems not. Are we talking about the health care system that covers the most people in the country? It’s not that, either. 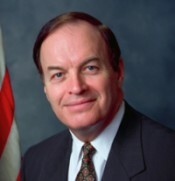 I wonder, then, what criteria Senator Shelby is using when he makes his statement because using the criteria that I think most people would use to judge the quality of the health care system, his statement can be considered nothing more than political grandstanding. While I don’t necessarily know what the best way is to improve our health care system, I certainly don’t think that the solution is to spew partisan hyperbole or to repeatedly parrot the party-line talking points. …especially when those talking points have no basis in reality.